DNA-based electron transfer reactions are seen in processes such as biosynthesis and radiation damage/repair, but are poorly understood. 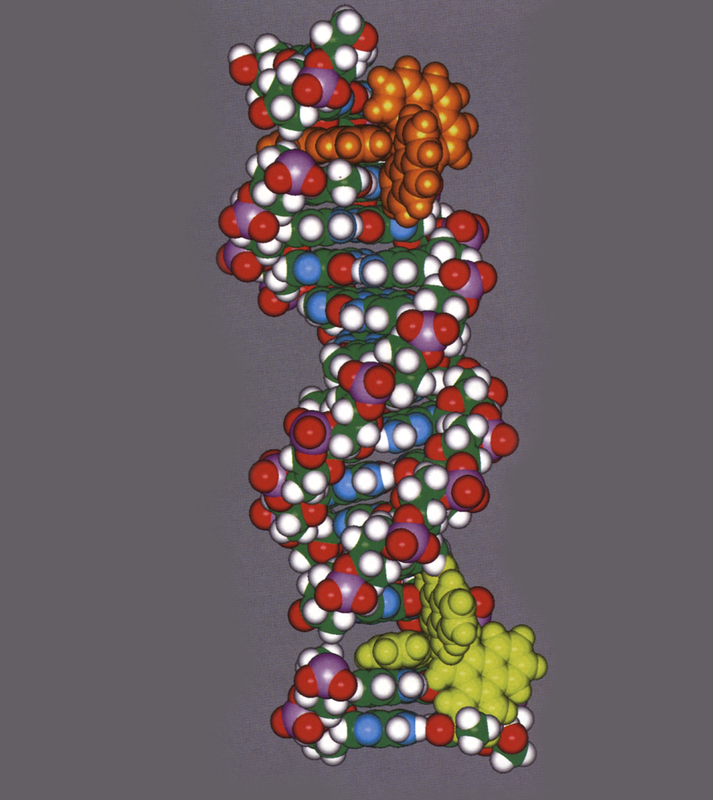 What kinds of experiments might tell us how far and how fast electrons can travel in DNA? What does modern theory predict? Electron transfer reactions involving DNA are clearly important in nucleic acid biosynthesis, regulation, damage, and repair. Studies of electron transfer between species bound covalently and noncovalently to DNA have given provocative results, and are at a similar stage to that reached several years ago by the protein electron transfer community [l-3]. Electron transfer has been shown to proceed over large distances (-15 to 40 A) in DNA (see Figs 1,2), but no systematic distance dependence studies of the reaction rates have yet been forthcoming [4-111. If these reactions proceed by the conventional bridge-mediated electron-tunneling mechanism familiar in proteins, in which the uncertainty principle allows leakage of the electron from donor to acceptor guided by the intervening medium, the rate of electron transfer would be expected to drop exponentially with distance, and the drop-off factor is expected to be substantial [l&13].